Bias is an universal given in decision making. Most drivers think they’re better then average drivers and most decision makers drive cars too. Just like crowded road brings the average speed down and irons out the extremes, so a group decision improves the average decision making, while slowing it down. 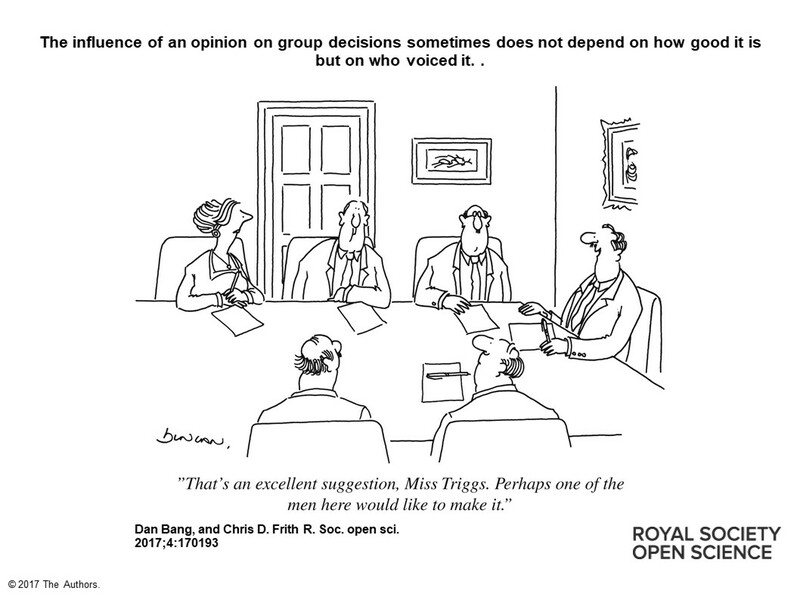 Dan Bang, Chris D. Frith published an good article on Making better decisions in groups in The Royal Society Open Science. Let me re-frame their ideas from the biased perspective of a facilitator. We’ve developed biasses to judge situation rapidly. As we have been taught our biasses, they have become part of our identity, our culture. Bias is also connected to our success and therefore our (positive) self image. Biasses feed on pretensions. So dealing with bias is the key to good decision making. And an important reason – but I’m biassed – to involve a facilitator. Perhaps it is best, to see bias as a verb and not as a noun. Bias like “to incline”. The article is very clear in the need for more diversity in better decision making. However, diversity also triggers biasses. We cannot separate what is being said from the person who says it. Your reputation – deserved or not – is part of your opinion. The cartoon shows one. In case of diversity, a facilitator strives to improve communications, understanding, listening, exchange. He or she will be biassed to promote exchange of diverse opinions, in stead of striving to get alignment. One of the ways to do so, is to use anonymity or visualization. As Watzalawick clearly states: “the relationship classifies the content”. Differences in power – real or perceived – determine expressions of opinions. Facilitators take care to create and maintain an environment which is safe enough for participants to share their opinions. We usually do this, by actively engaging relationships ourselves. A facilitator usually doesn’t act as a referee or chair, but takes part as a genuine participant. This position I like to call “autonomous”, aware of my own biasses. A leader is usually seen as some one who leads, shows the way, goes ahead. In fact, it is a paradox. The speed of a group is determined by the slowest. In complex situations, it is better to slow down, walk at the back, get an overview. A task of a facilitator is to slow down, beginning at the intake and even extending to after the session. And perhaps more importantly, a facilitator will show, that we learn more from mistakes and errors, and admitting them, then pushing on on what seems right. Rushing towards the wrong goal, will get us nowhere. Use a meeting and a group to find the right questions, have a bias towards problems, and the solutions will present themselves. 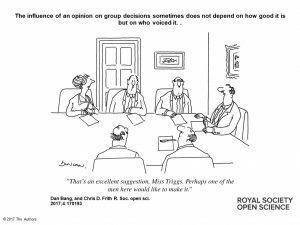 This entry was posted in Bias, Faciliteren, Group decision making, Uncategorized and tagged bias, diversity, facilitator, Watzlawick. Bookmark the permalink.